This project was a collaboration between Kimberly Mercurio Landscape Architecture and Cape Cod architect Alison Allessi of A3 Architects of Dennis, MA. 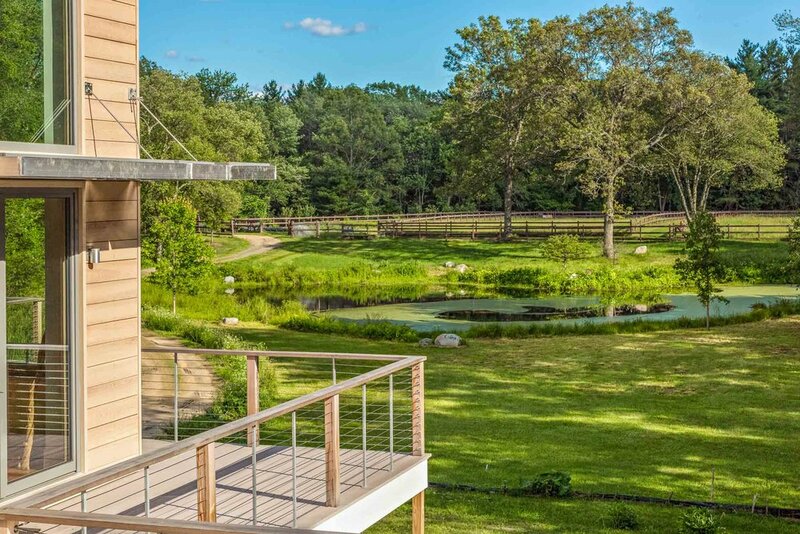 This home has a modern architectural style that melds with the verdant ten-acre setting. The prior owner abandoned this property leaving behind a partially constructed 15,000 sqft foundation positioned near including an orchard, and a pond. Alessi worked with the homeowners to design a building using the existing foundation to create a net-zero energy home. KMLA was tasked to provide a sustainable landscape design. KMLA's work including grading the property to enhance the pastoral features. The property required Conservation Commission approval. Landscape plans were drawn to include native and sustainable planting, including wetland plants, a retaining wall design, and lighting. Design New England Magazine featured the project in their May/June 2017 issue.